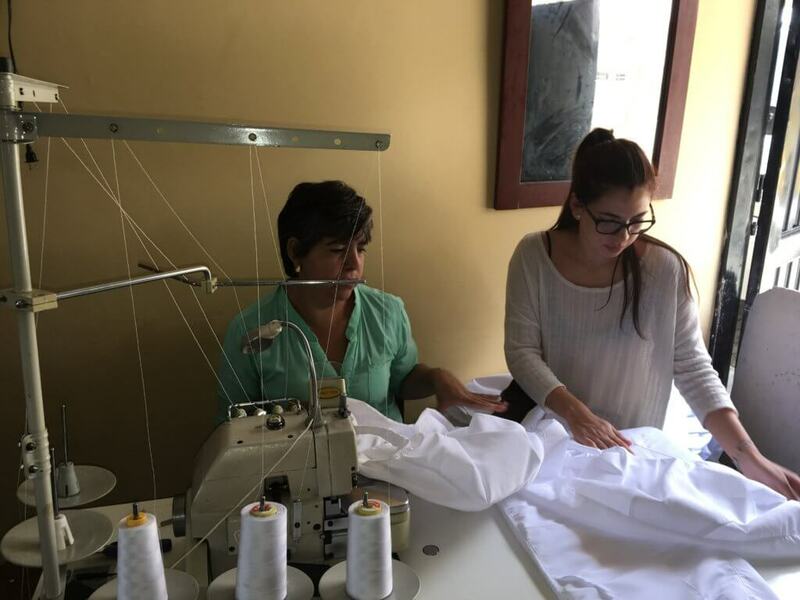 Sandra Taborda shows Accion's Liza Guzmán how Ovante helps her maximize scale and profit for her business. Sandra Taborda owns a small catering business in Manizales, Colombia. Ten years ago, after the birth of her son, and with six members of her extended family living under one roof, she decided to try her hand at selling homemade empanadas. Her door-to-door baked goods were a hit, and her brand, San-tehago (“Sandra makes it for you”), was born. Sandra is one of the participants in Ovante, an interactive digital platform with a vision to help microentrepreneurs build and enhance their business skills, grow their enterprises, and adopt healthy habits for using financial products and services. In 2016, Accion and FedEx launched an initiative to digitize Accion’s award-winning classroom business education program, making the program less expensive to deliver, more flexible, and more easily accessible for a broader audience. Evolved from Accion’s decades of experience designing and delivering financial literacy and business skills programs, Ovante offers a new approach by influencing behavior so that microentrepreneurs use financial services to their benefit exactly when they need them. Acting as a kind of financial coach for business growth, Ovante empowers participants to improve their businesses in real time. So far, Sandra is pleased with the results: “Ovante is great. I can say, ‘today I’m going to study [the module on] profit,’ and it’s going to help me.” While many microentrepreneurs may be unsure as to whether their business is profitable, Sandra could learn how her business was doing and how to increase profit through Ovante. This type of thinking also allows businesses to have more foresight. It’s often difficult for entrepreneurs to think beyond their present business needs, but with Ovante, Sandra has learned to think about her future profit when making decisions. Now she has a budget and analyzes her pricing strategy. Yolanda Cañón teaches daughter Alejandra techniques for sewing reusable shopping bags. Yolanda Cañón shares Sandra’s desire to manage her own learning. Yolanda, a seamstress who bought her first sewing machine with savings and her second with a microloan, is a single mother who raised three children on her own. Now, with her youngest daughter nearing the end of her Business Administration degree, Yolanda accesses Ovante at night after the busy workday. She is eager to apply learnings from the platform in her day-to-day work. “You can choose your area of study,” she explains. Yolanda highlighted how her learnings from Ovante led her to design her brand and think creatively about new distribution channels for her products. Ovante helps women like Sandra and Yolanda build healthy financial behaviors, supporting the long-term sustainability and viability of their businesses. Participants learn about separating family and business expenses and apply tools such as social media marketing and branding to scale their enterprises. So far, more than 3,000 small business owners like Sandra and Yolanda are already benefiting from Ovante, and more are joining the platform every day. Thanks to Accion’s partnership with FedEx, the platform is quickly expanding. We are excited to support countless deserving microentrepreneurs who could benefit from interactive and convenient business skills training, yet are constrained by time and physical distance. Ovante was designed and implemented by Accion Global Advisory Solutions and made possible by support from FedEx.